For all those businesses who are interested in their business and in the global trends in advertising I have put together some key metrics and summarised digital marketing in 2013. What really works in this overcrowded, busy environment. In last year’s Digital Marketer Report we talked about the paradigm shift in the way brands and consumers interact. How the highly-connected, always-on consumer holds absolute power in the brand relationship, and successful marketers know that they must put their customers at the heart of everything they do. This year’s most important — and challenging — imperative is for marketers to truly demonstrate their customer obsession by synthesizing disparate data trails and orchestrating thoughtful, meaningful and coordinated experiences as their customers move seamlessly in and out of channels. Being able to respond to these dynamic interactions in real time across all relevant channels is the foundation of cross-channel marketing and is a critical component to building long term advocacy. 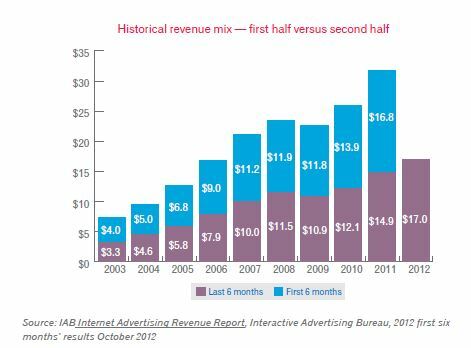 • Retail advertisers, despite an overall decline, continue to represent the largest category of Internet ad spending. However, automotive had the bigger year-over-year increase. • Marketers need good audience data, accurate and actionable segmentation, scalability and high-quality creative development in order to lay the groundwork for success in their online advertising campaigns.• Marketers must go into display advertising campaigns feeling comfortable about a longer timeline required to allow traction and drive the desired results. • This is the fourth year that Facebook has been the top search term overall, accounting for 4.13 percent of all searches, a 33 percent increase from 2011.• The search terms “yahoo” and “ebay” have appeared among the top 10 since the ranking was started in 2006.• Five Websites captured 20 percent of all search activity in Q4 2012, while the top 500 captured nearly 50 percent.• Navigational searches dominate the top search results as users continue to visit their favorite sites via search engines instead of directly entering a Web address into their browser’s URL bar. According to a recent Interactive Advertising Bureau (IAB) report, U.S. Internet advertising revenues totaled $8.7 billion in the second quarter of 2012, an increase of 5 percent from the 2012 first-quarter total of $8.3 billion and an increase of 14 percent from the 2011 second-quarter total of $7.7 billion. Year-to-date revenues through June 2012 totaled $17 billion, up 14 percent from the $14.9 billion reported in 2011. • Among young adults ages 18 to 34, mobile phones now tie with televisions when it comes to reach, with each platform reaching fully 94 percent of adults in this age cohort in a given week. • Adults age 50 and older spend 34 percent more time reading newspapers than the average newspaper reader. This older cohort also spends more time than average reading magazines, watching television and using eReaders. • Fifty-nine percent of adults say they email from at least two different devices during a seven-day period. Nearly one-third of adults under age 35 email from three or more devices each week. In order to address this, marketers need to ensure that their messages are tailored to engage consumers regardless of device. • Nearly one-quarter of social networking adults age 50 and older access social properties from a digital tablet, making them the most likely to do so from this device. It’s important to ensure that social media posts, including links to other online sites and videos, work from a mobile site.• Digital tablets and mobile phones are seriously competing with traditional computers when it comes to surfing the Web. Fully one in five young adults visit Websites from four different devices in a week, as do nearly one-quarter of adults ages 35 to 49. 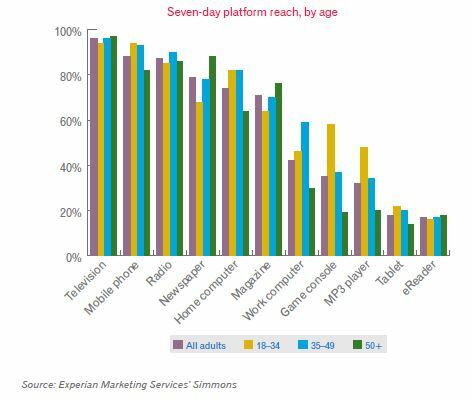 Consumers move between multiple devices and media platforms many times each day without batting an eye. For example, Dana was watching her favorite sitcom on the television when she saw a commercial for a musical she and her friend want to attend. She searched for reviews from her tablet, while texting her friend about it from her smartphone. They decided to purchase tickets, which Dana did from her tablet. She then forwarded her friend the confirmation email from her smartphone. When sequences like this happen, Dana’s not thinking about the different channels she used, she’s thinking about how great the musical is going to be — she’s simply living. • Millennials, the generation of 18- to 34-year-olds, represent upwards of 80 million consumers. Nearly two-thirds are under 30 years old, almost one-quarter have a college degree, 34 percent are married and many (60 percent) own a home. They have an average discretionary spend of $11,317.• Fifty-two percent of millennials rank far above or above average when it comes to being early adopters of technology. There is a strong opportunity to reach early adopter millennials via mobile, as they spend 14 percent more time engaged with their mobile devices in an average week than their generational peers. • Families with a mom, a dad and children account for 20 percent of U.S. households. Despite dramatic shifts in the living arrangements of U.S. consumers, married couples who are raising families remain a dynamic force for marketers to target and understand.• The Hispanic population is the largest racial/ethnic minority group in the United States today and is only growing larger. Nearly one-quarter of Americans ages 6 to 34 are Hispanic compared with less than 10 percent among those age 50 and older.• Nationwide, Hispanic households control 10 percent of all discretionary spending in the United States, with annual expenditures of $164.2 billion on nonessentials in 2012, up from $143.9 billion in 2011.• Representing about 25 percent of the U.S. population, baby boomers are nearly 80 million strong and account for more than 75 percent of America’s net worth. Deservedly, they continue to draw widespread interest and attention from the nation’s largest advertisers.The consumer landscape varies across ages, experiences, economic backgrounds, behaviour, attitudes and preferences. Demographic data alone is not enough for marketers to rely on to truly understand customers. Two people may be 45-year-old married males, living in suburban communities, with average household incomes of $150,000; therefore, marketers may be inclined to treat them similarly. However, one may be a tech-savvy small business owner who enjoys extreme outdoor activities and reading the news on his tablet, while the other may be a stay-at-home dad who likes to invite friends over to watch college sports on his home entertainment center. What will catch the eye of one of these men may go unnoticed by the other. Smart marketers recognize the need to differentiate their messages in order to reach the right people, at the right time, with the right message. Lifestyle and attitudinal characteristics that can be uncovered from segmentation tools, such as Experian’s Mosaic® USA, provide a richer sense of how to best connect with customers. Dana, a representation of a business’s best customer, as discussed earlier in the report (page 3) most closely aligns with the Urban Edge Mosaic segment. Knowing her segment and its associated characteristics provides marketers with a deeper understanding of Dana — she is more likely than average to be financially sensible, commute to work using public transportation and be digitally literate — which is much more useful to marketers than simply knowing her age, income and location. • making it personal: Personalized promotional mailings have 29 percent higher unique open rates and 41 percent higher unique click rates than nonpersonalized mailings. Personalized triggered mailings have similar lifts with 25 percent higher unique open rates and 51 percent higher unique click rates.• Pop-up windows: Last year, many brands (22 percent) reported utilizing pop-up windows on their Websites. That’s nearly one in four Websites, and we estimate that this number will grow in 2013. The majority of these brands use visit history to determine whether pop-ups should be displayed. Sixty-two percent of marketers reported only showing a pop-up to new visitors.• Paper collection: Experian Marketing Services’ 2012 Email Market Study reported 36 percent of brands still collect email addresses on paper. This practice exposes brands to a higher potential for bad addresses and input errors.• Welcome series emails: Emails that are part of a welcome series outperform standard promotional emails in terms of response and revenue earned. For instance, “Thanks for joining us” emails that kick off a welcome series have a 15 times higher response rate and 21 times higher revenue per email than standard promotional emails.• “Thank you” emails: Mailings sent to thank customers for subscribing to a list, joining a loyalty program or purchasing a product produce more than 2.5 times higher open rates and more than three times higher click rates than standard promotional emails. Sending a “Thank-you for your purchase” mailing in addition to any order confirmations can provide 6.5 times higher revenue per email.• Brand loyalty: Offers are valuable, but purchasing the right product from a preferred brand may be more so. While 80 percent of brand loyalists said they do not buy unknown brands merely to save money, 69 percent are always looking for special offers. Mailings without offers in the subject line had 24 percent higher transaction rates, but 11 percent lower revenue per email than loyalty mailings with offers in the subject line. The world has changed significantly for today’s email marketer. As email continues to reign as one of the most profitable and successful marketing channels, today’s email marketers are now expanding, embracing and integrating other channels into their email marketing programs. Brands setting a path toward true cross-channel optimization are experiencing improved campaign performance and increased customer engagement through integrated programs. With email strategies often acting as connectors to Website, mobile, social, print and in-store strategies, email has become the natural hub in driving cross-channel integration. The savviest email marketers are not only aware of this, but they are also actively seeking ways in which to leverage additional channels to optimize customer experiences. For example, American Eagle Outfitters® has strategically utilized email marketing technology to promote its mobile app to email subscribers who open the brand’s email on a mobile device. Additionally, other email marketers are leveraging social media advertising to retarget and re-engage inactive or nonresponsive email subscribers. In 2013, we expect to see more email marketers championing cross-channel integration in their organizations and using deeper and more diverse cross-channel strategies to improve customer acquisition and engagement programs. 25 to 34 feel the same way. Much has changed recently in terms of email deliverability. 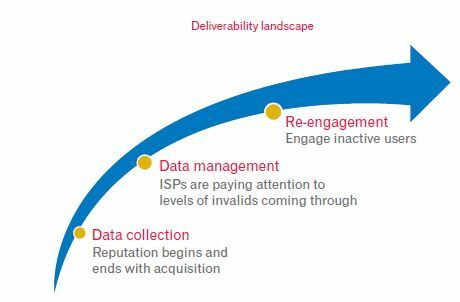 Internet service providers (ISPs) have significantly modified their filtering processes, putting heavy weight on engagement to determine a sender’s reputation and whether or not an email should get delivered to the inbox. To stay ahead of the curve, marketers need to be even more diligent in ensuring their messages are relevant and that they are mailing to addresses that are valid and active. 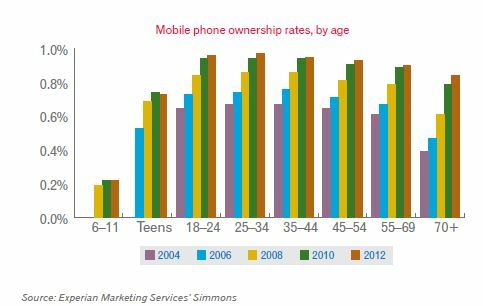 • More than nine in 10 U.S. adults (93 percent) own a mobile phone today, as do three-quarters of teens (73 percent). 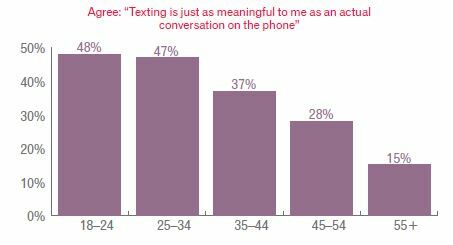 However, rates have remained relatively stable in the past two years, suggesting that ownership has reached a saturation point.• Forty-eight percent of adults ages 18 to 24 say that a conversation via text message is just as meaningful as a telephone call. A similar share of adults ages 25 to 34 feel the same way. • During a typical month, smartphone owners ages 18 to 24 send 2,022 mobile text messages and receive another 1,831, for a combined total of 3,853 texts sent and received. With every age bracket we move up, the number of mobile texts drops by roughly 40 percent.• In a given month, 8 percent of all smartphone owners report having shopped from their phones, whereas nearly 40 percent of tablet owners say they shopped from their tablets. Likewise, tablets are more likely than smartphones to be used to research products and compare prices.• The size of digital tablets isn’t keeping tablet owners from scanning barcodes with their devices. In fact, tablets are used by 13 percent of owners each month to scan barcodes, while smartphones are used by 8 percent of owners to scan codes. • Americans are still sensitive about disclosing their location. In fact, when asked how often they agree to give a mobile application access to their location information, only 14 percent of mobile phone owners said, “Most of the time,” while 44 percent answered, “Never.” • When it comes to integrating mobile into the broader marketing mix, marketers should take a top-down approach and work out how mobile fits into their broader business strategy. The mobile age is upon us. Consumers aren’t just going online; they are online on the go — using their smartphones more than ever. The once-humble phone is now your wallet, boarding pass, discount voucher, and social network. It is your life packaged in a powerful pocket-sized device. For marketers, the maturing of the mobile age represents huge opportunities. As consumer behavior undergoes a significant revolution, marketers can likewise revolutionize the way they engage audiences to drive more sales, boost engagement and loyalty, and generate invaluable buzz. Yet mobile marketing also comes with its challenges. Like never before, marketers need to be able to integrate technology-rich channels with more traditional channels and ensure that the customer experience is seamless whether they are in-store or online. Another more fundamental challenge lies in the definition of mobile marketing. Is mobile a distinct marketing channel, or an amalgamation of other channels? Is it simply a device to facilitate execution? How does it fit within the broader marketing mix? Mobile is proving itself to be a bona fide marketing channel that complements and supports many other channels in the multichannel mix. As more people use their smartphones to research products while in-store, for example, the mobile channel is becoming the “glue” connecting the online and offline worlds. • More than nine in 10 online adults (91 percent) say they access social media at least once a month. Even older adults have joined in, with nearly three-quarters (74 percent) of online adults age 65 and older accessing social media at least once a month, up from just 22 percent in 2008.• Today, 20 percent of online adults now engage in check-in activities at least once a month. • Today, 77 percent of adults on social networking sites say that they have shown support for a product, a service, a company, etc. by becoming a fan, a friend or a follower. When asked why they did so, the number one reason given by followers is to get a discount.• Social networking sites captured 15 percent of all U.S. Internet visits in December 2012. 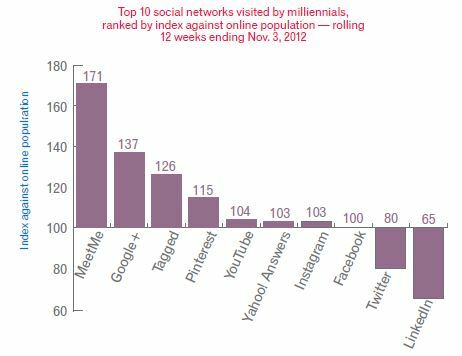 Facebook was the top-visited Website overall for the third year and accounted for 79.1 billion total U.S. visits in 2012. • Facebook Custom Audiences brings email marketing and Facebook advertising together in new and interesting ways since marketers now can use Facebook as a channel to amplify the reach of email messages and also to give their messages another chance of being seen by their customers.• Social data is rightfully classified as “big data,” and it is important to work with partners who understand how to manage, analyze and take action on vast amounts of unstructured data. While the data is vast, it is possible to distill it down to important information that can help to influence marketing programs and improve results.• Facebook drives more than 90 percent of the revenue generated from social sharing. The second sharing generation is the most profitable (I share, and then my friend clicks on the shared link and purchases something).• Calculating the value of word-of-mouth advertising is inherently challenging, but data has shown that the value of a single customer is greater than the value of his or her direct interactions with the brand. 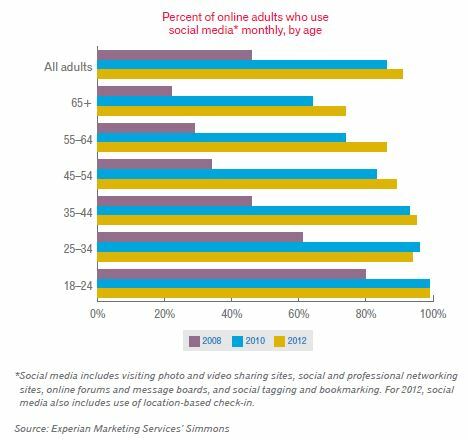 It’s hard to believe, but just a few years ago, fewer than half of online adults were regular users of social media. Today, more than nine in 10 online adults (91 percent) say they access social media at least once a month and among young adults, social media use is virtually universal, with 99 percent of 18- to 24-year-olds using social media. Even older adults have joined in, with nearly three quarters (74 percent) of online adults age 65 and older accessing social media at least once a month, up from just 22 percent in 2008. • Retail advertisers, despite an overall decline, continue to represent the largest category of Internet ad spending. However, automotive had the bigger year-over-year increase. • Marketers need good audience data, accurate and actionable segmentation, scalability and high-quality creative development in order to lay the groundwork for success in their online advertising campaigns.• Marketers must go into display advertising campaigns feeling comfortable about a longer timeline required to allow traction and drive the desired results. • This is the fourth year that Facebook has been the top search term overall, accounting for 4.13 percent of all searches, a 33 percent increase from 2011.• The search terms “yahoo” and “ebay” have appeared among the top 10 since the ranking was started in 2006.• Five Websites captured 20 percent of all search activity in Q4 2012, while the top 500 captured nearly 50 percent.• Navigational searches dominate the top search results as users continue to visit their favourite sites via search engines instead of directly entering a Web address into their browser’s URL bar. According to a recent Interactive Advertising Bureau (IAB) report, U.S. Internet advertising revenues totalled $8.7 billion in the second quarter of 2012, an increase of 5 percent from the 2012 first-quarter total of $8.3 billion and an increase of 14 percent from the 2011 second-quarter total of $7.7 billion. Year-to-date revenues through June 2012 totalled $17 billion, up 14 percent from the $14.9 billion reported in 2011. As we’ve discussed in this report, the explosion of communication channels available to consumers and marketers, along with the data collected across these myriad channels, has created a very exciting, albeit challenging, marketing environment. It is no longer enough to utilize multiple channels, now marketers must unite their messages across those touch-points to create relevant experiences regardless of the customer’s channel or device preferences. Every vertical segment faces the challenge of meeting the demands of the well-informed consumer, which also leads to the inevitable outcome of commoditization. The most effective antidote to this trend of steep discounting and consumer price myopia is to differentiate your business by providing excellent service and one-to-one connections — in other words, be customer obsessed. To today’s consumer, life is the ultimate channel. They envision the summer party they’ll throw after they get a new grill, not the channels they’ll use on their path to purchasing it. If a brand doesn’t provide a seamless experience, the customer is likely to change brands or stores rather than change their mind about the grill.